We're here at the Boylston Street Apple Store for Media Day. No line outside, but plenty of reporters playing with the toys. Ron Johnson, Apple's SVP of Retail, is here with hizonnah Mayor Thomas Menino to open the largest Apple Store in the country (confirmed!). The Mayah "loves" the store and made a joke at the expense of the Back Bay Architectural Commission, which was hesitant to approve the project. Menino said he wasn't a fan of the prior building and didn't know why anyone would want to save it for "historical" reasons. Get more details on the new location after the jump. Head of Apple Retail Ron Johnson gave some insight into the planning behind the Boylston Street location. The spot was picked out in 2000, but took eight years of planning to get it built. Because of Apple's recent success, the store has grown significantly from what was originally planned. If the store were built back in 2000, when the retail initiative was just getting started, it would have been one floor. If it were built in 2005, when the iPod was just taking off, it would have been two floors. Now, with the success of the iPhone, iPod and Mac lines, the store has three floors. The first floor is all Mac, the company's "most important product" according to Johnson. Floor two is dedicated to iPod, iPhone and all the third party accessories Apple offers. The third floor is dedicated to service, with a massive Genius Bar, sections for one-on-one, workshops and a second location for Apple's new "Pro Labs" initiative. 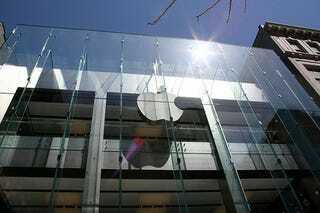 The Genius Bar, which boasts 17 black stools, can serve 1,000 people per day at full capacity, with the store open from 8AM to 11PM. The store is also environmentally friendly, with vegetation on the roof and a rainwater recollection system which directs water from the roof directly into the Back Bay water table. The store opens tomorrow, Thursday the 15th, at 6PM.